Wong Lo Kat Herbal Tea: Struggling Hard for What? Will Dangdang Get What It Wants? 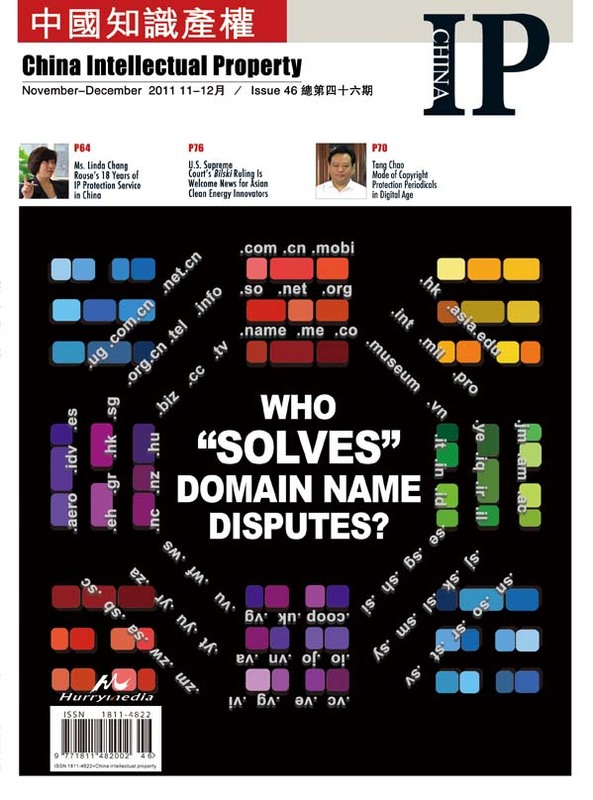 In China, domain name disputes are resolved in accordance with China Internet Network Information Center (CNNIC)’s Domain Name Dispute Resolution Policy (DNDRP), which was formulated in 2002 and has been implemented since March 17th, 2006 after amendment. It is based on WIPO’s 1999 research report, the Uniform Domain Name Dispute Resolution Policy derived from the WIPO’s report and issued by the Internet Corporation for Assigned Names and Numbers (ICANN), and the initial domain name dispute resolution policies set up by the CNNIC shortly after the releasing of the former two. However, the Policy has not given a clear definition to “bad faith act,” resulting in difficulties in its being implementation in practice. (c) The disputed domain name holder has registered or has been using the domain name in bad faith. The three conditions must be met for any complaint. In other words, there are three constitutive requirements for domain name, namely, “identical with or confusingly similar to,” “no right or legitimate interest” and “bad faith,” which must be satisfied at the same time. Therefore, “bad faith” becomes one of the indispensable conditions for a disputed domain name to be transferred or cancelled. (d) Other circumstances which may prove the bad faith. (c) He is making a legitimate noncommercial or fair use of the domain name, without intent of or commercial gain to misleadingly divert consumers. (h) Though he ought to know it is a well-known names or mark of others. There are other circumstances of “bad faith” in cyber piracy in addition to the above-mentioned nine kinds of cyber squatting, which may be involved in a domain name case more or less. According to the axiom that “the proof lies upon him who claims,” the complainant shall bear the burden of proof that the respondent shall be responsible for one or more of bad faith acts mentioned above. However, it is usually difficult for the complainant to prove. First, some bad faith acts, such as “the purpose of registration or acquirement is to sell, rent or otherwise transfer the domain name registration to the complainant’s competitor,” are not easy to prove. Some verdicts even stresses that “selling” does not constitute “bad faith,” that bad faith acts cannot be proved if the complainant has only evidence that the respondent sold it to unspecified person or intended to sell, and that these can not prove the complainant’s registration constitutes “cyber piracy for the purpose of selling, renting or otherwise transferring the domain name registration to complainant’s competitor.” Therefore, it is very difficult for the complainant to prove that the respondent engages in domain squatting in order to damage the complainant’s reputation or disrupt the complainant’s normal business or create confusion with the complainant’s name or mark so as to mislead the public. It is also very difficult for the panel to ascertain whether the respondent has “bad faith” intent or not. Firstly, the panel is required to make a decision for a domain name within dozens of days. Secondly, there is no possibility for the panel to ascertain evidence because the documents are reproductions submitted by the parties. Last but not least, there is no chance for testimonies in person, defenses and cross-examination between the parties due to the adoption of “written examination” in domain name resolution. Therefore, it is difficult for the panel to make a prudent, fair and justifiable decision during a short period that the respondent had bad faith in his registration of the domain name in dispute where there is no hearings of witnesses and no cross-examination. However, the most important reason may be that the panel may decide the case without consideration of the existence of bad faith of the respondent in a domain name resolution. If the Dispute Resolution Service Provider rules in its decision to cancel the registered domain name or to transfer it to the Complainant, the domain name Registrar, before enforcing the decision, shall wait 10 calendar days calculating from the date on which the decision is published. If during such waiting period the Respondent submits valid proof attesting that a competent judicial authority or arbitration institution has accepted the relevant dispute, the registrar shall not enforce the decision of the Dispute Resolution Service Provider. (c) If the judicial authority or arbitration institution has rendered a judgment or an award that has become legally effective, the Registrar shall enforce such judgment or award. It is generally recognized that bad faith is an important element for the judgment of economic compensation quantity in civil and commercial cases, regardless of whether they are heard by the court or arbitrated by the panel. China is still holding up the banner of compensative principle instead of punitive damages in civil lawsuits. It can be seen from the foregoing paragraphs that dispute settlement procedure pays no attention to the civil tort liability incurred in dispute. Such liability can be settled through litigation or arbitration. Therefore, it is enough for the panel or court to make judgments in domain name cases by taking “identical with or confusingly similar to” and “no right or legitimate interest” into consideration. It shall be deemed as “identical with or confusingly similar to” where the disputed domain name is identical with or confusingly similar to the complainant’s name or mark in which the complaint has legal civil rights or interests prior to his complaint. The respondent’s cyber piracy shall constitute civil infringement or unfair competition against the complainant’s existing legal civil rights and interests if there is no exception under such circumstances. If there is exception, it shall be established where the complainant has “no right or legitimate interest” in the disputed domain name. However, it shall not be deemed as “no right or legitimate interest” where the respondent has legitimated rights and interest in the domain name according to laws and contracts concluded between and among him and the complainant even if he has legal civil rights or interests prior to his complaint. Their rights shall be coexisted and no infringement happened. However, it has potential conflict with Article 9. The author does not agree with the time limitation of “before receiving the complaint” and thinks that it should be extended to the time of registration of the disputed domain name. The Article 5 of Interpretation of The Supreme People’s Court on Application of Laws in the Trial of Civil Disputes over Domain Names of Computer Network also provides that “If the defendant produces evidence to prove that the domain names he owned have gotten certain fame before the case, and can be distinguished to the prosecutor’s registered trademarks or domain names, or other conditions prove that the defendant has no malice, the people’s court may convict the defendant not malicious.” The author also thinks that something should be improved in the time limitation set by the Interpretation. In conclusion, the author believes that the provisions of “identical with or confusingly similar to,” “no right or legitimate interest” and “bad faith,” are not proper. “Bad faith” has no reason to be included in the constitutive requirements of cyber piracy because the dispute settlement mechanism focuses on the transfer and cancellation of the disputed domain name and has nothing to do with economic compensation. The other two constitutive requirements are enough for such settlement.